JOSEPH KABILA’S machinations to keep control of the Democratic Republic of Congo have crumbled one by one. But his last desperate gamble—handing power to the friendly leader of an opposition party—is having a tad more success. 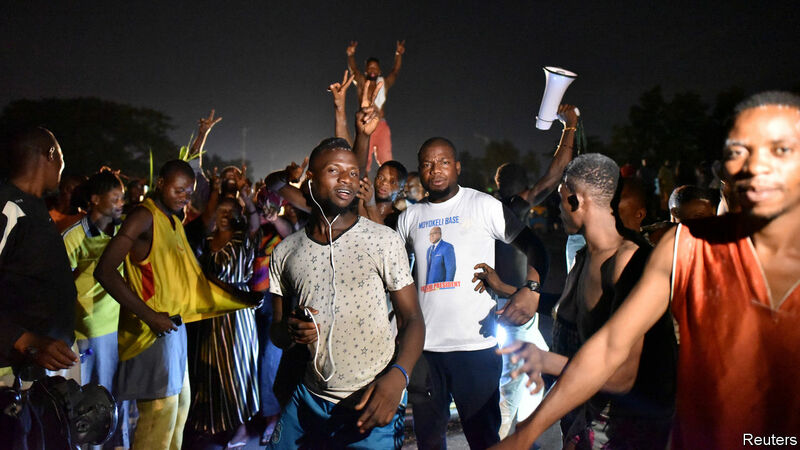 In the early hours of January 20th, Congo’s constitutional court (stacked with government loyalists) ceremoniously ruled that a presidential election held on December 30th had been won by Félix Tshisekedi, the friendly opposition leader, with 39% of the vote. It said that Martin Fayulu, a former oil executive who has promised to fight corruption, had come second with 35% of the vote. The court’s judgment flies in the face of extensive evidence that the election was actually won by Mr Fayulu. A tally by the Financial Times of leaked data found that Mr Fayulu had won almost 60% of the vote and that Mr Tshisekedi was far behind, with 19%. Congo’s Catholic bishops, who sent out 40,000 observers, also said the official result did not match their tally. Mr Kabila, who has been in power for 18 years, is no stranger to dirty tricks. In 2015 he tried to change the constitution and abolish term limits, so that he might join the regional club of presidents-for-life. After that failed because of massive protests, Mr Kabila simply refused to hold an election when his second term ended in 2016. He stayed in office for another two years. But more protests and pressure from regional powers forced him to set a date for the poll. Mr Kabila wanted voters to elect his handpicked successor, Emmanuel Ramazani Shadary, a former interior minister. But he proved too unpopular to win even a rigged election. The vote count was delayed for several days amid an internet blackout. Mr Fayulu, who has threatened to investigate the wholesale theft of Congo’s mineral wealth by members of the ruling class, appears to have lost the count. He is backed by Mr Kabila’s two biggest adversaries, Jean-Pierre Bemba (a former warlord) and Moïse Katumbi (a tycoon), both of whom were barred from standing. Mr Kabila apparently saw him as the biggest threat to his continuing influence. The African Union inititally expressed concern about the vote and called on Congo to hold off on officially handing victory to Mr Tshisekedi. But following the court ruling the AU seemed to back down. The Southern African Development Community, a regional bloc that had called for a recount and government of national unity, congratulated Mr Tshisekedi. So did the presidents of South Africa, Kenya and Tanzania. Most are concerned mainly with preserving stability in Congo, a sprawling and ill-governed country that could destabilise its neighbours if it descends again into civil war. Yet the electoral stitch-up has so infuriated many Congolese that it, too, presents a risk to stability. Mr Fayulu has asked his supporters to stage peaceful protests across the country. There is a good chance that government troops will use force to disperse them. If people are killed then outrage may spread rapidly. Meanwhile Mr Kabila’s allies “are furious—he cannot even cheat successfully,” says someone close to the president. For now the police and army are backing Mr Kabila. But their loyalty is fickle. As may be that of Mr Tshisekedi, who celebrated the court’s decision by sipping champagne. He has made friendly noises towards Mr Kabila, calling him “an important political partner”. He may be unable to throw his weight around much without Mr Kabila’s co-operation, since Mr Kabila’s party dominates the legislature. Indeed, Mr Kabila’s critics say he wants to play puppet-master to Mr Tshisekedi. But he may not be able to. Power can quickly drain from a former president to a new one, and it is far from clear that Mr Kabila has the political skill to remain in charge when he is no longer in office. The game is not over. Nor, probably, is the cheating.